Prof. Denis Ryan Presenting talk on the Management of Stress in Life. The ICHAS College would like to thank all who attended our Free talk for Limerick Mental Health week last Wednesday 12th October. 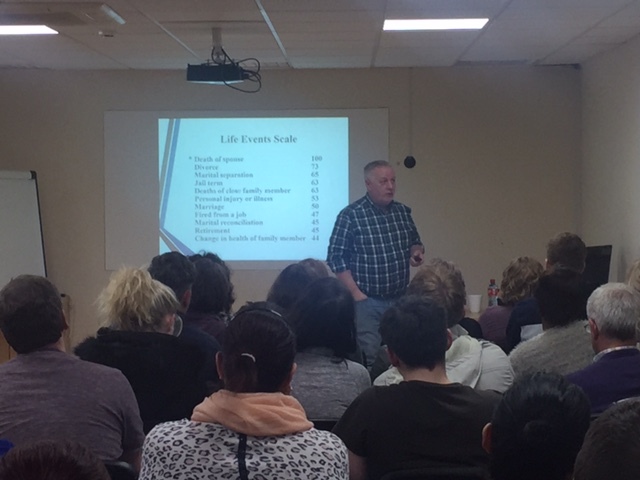 There was a fantastic turn out and we are delighted as a college to have been able to provide these talks based on such important topics in line with Limerick Mental Health week. A big thank you to all those involved in the planning and organising of this event and a special thank you to Prof. Denis Ryan who gave a fantastic informative talk regarding the Management of Stress in life and to Christine Beekman who gave us a wonderful introduction into the world of Mindfulness based around worry and anxiety. The response to these two talks was fantastic with many enquiries as to when we might hold another event of this kind. We will keep the website updated regarding any planned talks and hope that they will be of benefit to people on a personal and professional level.